There was also much in these three great revolutions reminiscent of the age-old Russian revolt against the authorities and traditions, which went back deep into Russian history. It was precisely this powerful element of spontaneous, unrestrained, destructive insurrection inherent in popular movements which had made the aristocratic revolutionaries of the nineteenth century wary of the prospect of a popular rising. Born out of the enduring ignorance of ordinary people and their hatred towards the authorities, this unbridled anarchic spirit reflected Russia’s almost complete lack of firm democratic traditions, an authoritarian mentality of the masses and a poorly developed political culture of all sections of society. The rebellious mood of the people was also heightened by their destitution and poverty. In Russia, the institution of small- and medium-scale private ownership, particularly the ownership of land, was dangerously underdeveloped. There was a near absence of a middle class which might have grown on the basis of such ownership and which might not have been so vulnerable to radical, extremist slogans. It was hardly surprising, that in Russian circumstances popular movements became breeding grounds for extreme and ultra-radical elements which manipulated public consciousness and social behavior of the masses and claimed to speak and act on their behalf. By the start of the twentieth century Russia was ready for its first revolution. The soil for it had been prepared by a series of crises which affected the country’s economy, social and ethnic relations, political system. The situation had been aggravated by the fact that the industrial modernization had drawn Russia more closely into the circle of other industrialized capitalist nations and thus also made it vulnerable to world cycles of economic booms and slumps. The world economic crisis of 1900-1903 hit Russia particularly hard as it was combined with poor domestic harvest. To make matters worse, Russia’s population also felt the strains of the Russo-Japanese War (1904-1905) which had broken out as a result of a conflict of interests between the two countries in Manchuria (a region in northern China) and in parts of Korea. The Japanese repeatedly sought a Russian withdrawal from Manchuria, but the Russian government refused to give in to Japanese demands, believing that Japan was only a weak military adversary. 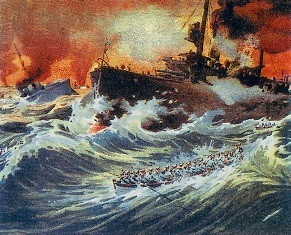 However, during a year and a half of hostilities Russia suffered an unbroken series of military defeats both on land and on sea. The conflict ended with a relatively mild peace settlement for Russia, mainly due to the diplomatic and political skills of Sergei Witte, the former minister of finance, who negotiated the truce. The war, however, had badly damaged the government’s prestige.